Temporomandibular joint dysfunction (TMD) is a term used for disorders affecting the muscles of mastication and the temporomandibular joints (TMJ), including the mandibular condyles, fossa of the temporal bone, TMJ capsule and the articular disc.1American Academy of Orofacial Pain. Orofacial Pain: Guidelines for assessment, diagnosis, and management. deLeeuw R, Klasser GD eds. 5th edition. Chicago, IL: Quintessence Publishing; 2013:127-86.,2Butts R, Dunning J, Perreault T, Mettille J, Escaloni J. Pathoanatomical characteristics of temporomandibular dysfunction: Where do we stand? (Narrative review part 1). J Bodywork Movement Ther 2017; http://dx.doi.org/10.1016/j.jbmt.2017.05.017.,3de Sena MF, de Mesquita KSF, Santos FGR, Silva FWGP, Serrano KVD. Prevalence of temporomandibular dysfunction in children and adolescents. Rev Paul Pediatr 2013;31(4):538-45. TMD is characterized by pain in the TMJ and periauricular region, and/or the muscles of mastication.2Butts R, Dunning J, Perreault T, Mettille J, Escaloni J. Pathoanatomical characteristics of temporomandibular dysfunction: Where do we stand? (Narrative review part 1). J Bodywork Movement Ther 2017; http://dx.doi.org/10.1016/j.jbmt.2017.05.017.,3de Sena MF, de Mesquita KSF, Santos FGR, Silva FWGP, Serrano KVD. Prevalence of temporomandibular dysfunction in children and adolescents. Rev Paul Pediatr 2013;31(4):538-45.,4AAPD. Guideline on Acquired Temporomandibular Disorders in Infants, Children, and Adolescents. Reference Manual 2015;37(6):273-8. Available at: http://www.aapd.org/media/Policies_Guidelines/G_TMD.pdf. Signs and symptoms include limited mouth opening, restricted/asymmetric mandibular movement, and TMJ noise.3de Sena MF, de Mesquita KSF, Santos FGR, Silva FWGP, Serrano KVD. Prevalence of temporomandibular dysfunction in children and adolescents. Rev Paul Pediatr 2013;31(4):538-45.,4AAPD. Guideline on Acquired Temporomandibular Disorders in Infants, Children, and Adolescents. Reference Manual 2015;37(6):273-8. Available at: http://www.aapd.org/media/Policies_Guidelines/G_TMD.pdf.,5Pihut M, Gorecka M, Ceranowicz P, Wieckiewicz M. Management of pain related to temporomandibular joint disc displacement with reduction. Pain Res Management 2018;Article ID 9089286, 6 pages. doi.org/10.1155/2018/9089286.,6Schiffman E, Ohrbach R, Truelove E, Look J, Anderson G, Goulet JP, List T, et al. Diagnostic criteria for temporomandibular disorders (DC/TMD) for clinical and research applications: recommendations of the International RDC/TMD Consortium Network and Orofacial Pain Special Interest Group. J Oral Fac Pain Headache 2014;28(1):6-27. TMD can cause a clicking/popping noise emanating from the TMJ when mandibular movement occurs and the condyle crosses the rear margin of the articular disc.3de Sena MF, de Mesquita KSF, Santos FGR, Silva FWGP, Serrano KVD. Prevalence of temporomandibular dysfunction in children and adolescents. Rev Paul Pediatr 2013;31(4):538-45.,5Pihut M, Gorecka M, Ceranowicz P, Wieckiewicz M. Management of pain related to temporomandibular joint disc displacement with reduction. Pain Res Management 2018;Article ID 9089286, 6 pages. doi.org/10.1155/2018/9089286. Displacement of the articular disc may occur with/without reduction.5Pihut M, Gorecka M, Ceranowicz P, Wieckiewicz M. Management of pain related to temporomandibular joint disc displacement with reduction. Pain Res Management 2018;Article ID 9089286, 6 pages. doi.org/10.1155/2018/9089286.,6Schiffman E, Ohrbach R, Truelove E, Look J, Anderson G, Goulet JP, List T, et al. Diagnostic criteria for temporomandibular disorders (DC/TMD) for clinical and research applications: recommendations of the International RDC/TMD Consortium Network and Orofacial Pain Special Interest Group. J Oral Fac Pain Headache 2014;28(1):6-27. TMD adversely affects quality of life (QoL). Available treatments for TMD include conservative approaches and invasive interventions. It is generally agreed that a conservative approach should be the first line of therapy before consideration of more invasive treatment modalities. TMD is characterized by pain in the TMJ and periauricular region, and/or in the muscles of mastication. Estimates for the prevalence of TMD vary widely. In the US, prevalence of 10% to 58% has been reported, with a lifetime risk as high as 85%.2Butts R, Dunning J, Perreault T, Mettille J, Escaloni J. Pathoanatomical characteristics of temporomandibular dysfunction: Where do we stand? (Narrative review part 1). J Bodywork Movement Ther 2017; http://dx.doi.org/10.1016/j.jbmt.2017.05.017.,7Dıraçoǧlu D, Yıldırım NK, Saral I, Özkan M, Karana A, Özkan S, Aksoy C. Temporomandibular dysfunction and risk factors for anxiety and depression. J Back Musculoskel Rehabil 2015;1:1-5.,8Song PC, Schwartz J, Blitzer A. The emerging role of botulinum toxin in the treatment of temporomandibular disorders. Oral Dis 2007;13:253-60. TMD occurs in all age groups, and among children and adolescents the reported prevalence ranges from 16% to 68%.3de Sena MF, de Mesquita KSF, Santos FGR, Silva FWGP, Serrano KVD. Prevalence of temporomandibular dysfunction in children and adolescents. Rev Paul Pediatr 2013;31(4):538-45.,4AAPD. Guideline on Acquired Temporomandibular Disorders in Infants, Children, and Adolescents. Reference Manual 2015;37(6):273-8. Available at: http://www.aapd.org/media/Policies_Guidelines/G_TMD.pdf.,9Scrivani SJ, Khawaja SN, Bavia PF. Nonsurgical management of pediatric temporomandibular joint dysfunction. Oral Maxillofac Surg Clin North Am 2018;30(1):35-45. In one study in South-East Asia, approximately 42% of students 19 years-of-age and older complained of mild/moderate TMD.7Dıraçoǧlu D, Yıldırım NK, Saral I, Özkan M, Karana A, Özkan S, Aksoy C. Temporomandibular dysfunction and risk factors for anxiety and depression. J Back Musculoskel Rehabil 2015;1:1-5. Twelve percent of TMD became chronic, and the majority of complaints occur in females.4AAPD. Guideline on Acquired Temporomandibular Disorders in Infants, Children, and Adolescents. Reference Manual 2015;37(6):273-8. Available at: http://www.aapd.org/media/Policies_Guidelines/G_TMD.pdf.,7Dıraçoǧlu D, Yıldırım NK, Saral I, Özkan M, Karana A, Özkan S, Aksoy C. Temporomandibular dysfunction and risk factors for anxiety and depression. J Back Musculoskel Rehabil 2015;1:1-5.,10Kim T-Y, Shin J-S, Lee J, Lee YJ, Kim M-R, Ahn Y-j, Park KB, Hwang DS, Ha IH. Gender difference in associations between chronic temporomandibular disorders and general quality of life in Koreans: A cross-sectional study. PLoS ONE 2015;10(12) e0145002. It is hypothesized that repetitive forces and abnormal loading reduces TMJ lubrication, and that affected articular discs with altered morphology are easier to displace.2Butts R, Dunning J, Perreault T, Mettille J, Escaloni J. Pathoanatomical characteristics of temporomandibular dysfunction: Where do we stand? (Narrative review part 1). J Bodywork Movement Ther 2017; http://dx.doi.org/10.1016/j.jbmt.2017.05.017.,5Pihut M, Gorecka M, Ceranowicz P, Wieckiewicz M. Management of pain related to temporomandibular joint disc displacement with reduction. Pain Res Management 2018;Article ID 9089286, 6 pages. doi.org/10.1155/2018/9089286. The lateral pterygoid muscle is thought to play an important role in TMD, with its superior head contributing to anterior disc displacement.2Butts R, Dunning J, Perreault T, Mettille J, Escaloni J. Pathoanatomical characteristics of temporomandibular dysfunction: Where do we stand? (Narrative review part 1). J Bodywork Movement Ther 2017; http://dx.doi.org/10.1016/j.jbmt.2017.05.017. Further, injuries caused by sports activities, accidents, physical abuse and third molar extractions are clear etiologies for TMD.4AAPD. Guideline on Acquired Temporomandibular Disorders in Infants, Children, and Adolescents. Reference Manual 2015;37(6):273-8. Available at: http://www.aapd.org/media/Policies_Guidelines/G_TMD.pdf. In one review, TMD was present in up to 79% of patients who had experienced whiplash (median of 35%), compared to 1.7% to 13% of patients with no history of whiplash.12Häggman-Henrikson B, Rezvani M, List T. Prevalence of whiplash trauma in TMD patients: a systematic review. J Oral Rehabil 2014;41(1):59-68. Facial asymmetry and ankylosis also play a role and may occur as sequelae of treatment for mandibular fractures.4AAPD. Guideline on Acquired Temporomandibular Disorders in Infants, Children, and Adolescents. Reference Manual 2015;37(6):273-8. Available at: http://www.aapd.org/media/Policies_Guidelines/G_TMD.pdf. In one review, TMD was present in up to 79% of patients who had experienced whiplash (median of 35%), compared to 1.7% to 13% of patients with no history of whiplash. TMD is associated with poor quality of sleep, depression, stress and anxiety, lost school days, and impaired interpersonal relationships, social activity and employment.4AAPD. Guideline on Acquired Temporomandibular Disorders in Infants, Children, and Adolescents. Reference Manual 2015;37(6):273-8. Available at: http://www.aapd.org/media/Policies_Guidelines/G_TMD.pdf.,8Song PC, Schwartz J, Blitzer A. The emerging role of botulinum toxin in the treatment of temporomandibular disorders. Oral Dis 2007;13:253-60. In a recent systematic review, 78% of participants reported being tired or experiencing TMD pain when they awoke.15Bitiniene D, Zamaliauskiene R, Kubilius R, Leketas M, Gailius T, Smirnovaite K. Quality of life in patients with temporomandibular disorders. A systematic review. Stomatologija, Baltic Dent Maxillofac J 2018;20:3-9. In a large-scale population-based survey, correlations were found for TMD and other conditions, including tinnitus, hearing difficulties and dizziness.16Song H-S, Shin J-S, Lee J, Lee YJ, Kim M-R, Cho J-H, Kim KW, Park Y, Song HJ, Park SY, Kim S, Kim M, Ha IH. Association between temporomandibular disorders, chronic diseases, and ophthalmologic and otolaryngologic disorders in Korean adults: A cross-sectional study. PLoS ONE 2018;13(1): e0191336. https://doi.org/10.1371/journal.pone.0191336. 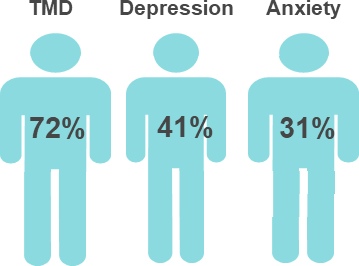 Stress that increased TMD complaints, depression and anxiety was reported in one study by 72%, 41% and 31% of patients, respectively.7Dıraçoǧlu D, Yıldırım NK, Saral I, Özkan M, Karana A, Özkan S, Aksoy C. Temporomandibular dysfunction and risk factors for anxiety and depression. J Back Musculoskel Rehabil 2015;1:1-5. (Figure 2) The Research Diagnostic Criteria for TMD include assessment of muscular and TMJ-related TMD, and QoL measures.8Song PC, Schwartz J, Blitzer A. The emerging role of botulinum toxin in the treatment of temporomandibular disorders. Oral Dis 2007;13:253-60. TMD is associated with poor quality of sleep, depression, stress and anxiety, lost school days, and impaired interpersonal relationships, social activity and employment. The impact of TMD is underscored by findings in a recent study.17Han DH. The association between temporomandibular disorders and suicide ideation in a representative sample of the South Korean population. J Oral Fac Pain Headache 2014;28(4):338-45. Among almost 17,000 individuals in the Fourth Korean National Health and Nutrition Examination, respondents reporting clicking, tenderness on palpation, or limited opening (<30 mm) at least weekly had a 26% increased risk for suicidal intent. For individuals with pain/discomfort or severe TMD, respectively, a 35% and 75% increased risk for suicidal intent was found.17Han DH. The association between temporomandibular disorders and suicide ideation in a representative sample of the South Korean population. J Oral Fac Pain Headache 2014;28(4):338-45. To manage TMD, an understanding of the etiological factors involved, and a correct definitive diagnosis, is required.8Song PC, Schwartz J, Blitzer A. The emerging role of botulinum toxin in the treatment of temporomandibular disorders. Oral Dis 2007;13:253-60.,18Butts R, Dunning J, Pavkovich R, Mettille J, Mourad F. Conservative management of temporomandibular dysfunction: A literature review with implications for clinical practice guidelines (Narrative review part 2). J Bodyw Mov Ther 2017;21(3):541-8. Treatment goals include pain reduction, and improvements in function and QoL.4AAPD. Guideline on Acquired Temporomandibular Disorders in Infants, Children, and Adolescents. Reference Manual 2015;37(6):273-8. Available at: http://www.aapd.org/media/Policies_Guidelines/G_TMD.pdf.,9Scrivani SJ, Khawaja SN, Bavia PF. Nonsurgical management of pediatric temporomandibular joint dysfunction. Oral Maxillofac Surg Clin North Am 2018;30(1):35-45. Conservative approaches are considered the first line of therapy. The need for treatment that includes psychosocial interventions is also recognized.19Aggarwal VR, Lovell K, Peters S, Javidi H, Joughin A, Goldthorpe J. Psychosocial interventions for the management of chronic orofacial pain. Cochrane Database Syst Rev 2011;(11: ):CD008456. Irreversible therapies, e.g., occlusal adjustments, should be avoided in children and adolescents, due to limited data on efficacy.4AAPD. Guideline on Acquired Temporomandibular Disorders in Infants, Children, and Adolescents. Reference Manual 2015;37(6):273-8. Available at: http://www.aapd.org/media/Policies_Guidelines/G_TMD.pdf. Conservative approaches are considered the first line of therapy. Occlusal splints are frequently used. These can stabilize the TMJ and decrease parafunction.4AAPD. Guideline on Acquired Temporomandibular Disorders in Infants, Children, and Adolescents. Reference Manual 2015;37(6):273-8. Available at: http://www.aapd.org/media/Policies_Guidelines/G_TMD.pdf.,11Zhang C, Wu J-Y, Deng D-L, He B-Y, Tao Y, Niu Y-M, Deng M-H. Efficacy of splint therapy for the management of temporomandibular disorders: a meta-analysis. Oncotarget 2016;7(51):84043-53. In a meta-analysis of randomized, controlled clinical trials in adults, compared to control groups a significant improvement in maximal mouth opening (MMO) was observed following splint therapy in adults with an initial MMO of 37 to 45 mm.11Zhang C, Wu J-Y, Deng D-L, He B-Y, Tao Y, Niu Y-M, Deng M-H. Efficacy of splint therapy for the management of temporomandibular disorders: a meta-analysis. Oncotarget 2016;7(51):84043-53. After adjusting for confounders, in comparison to control groups, no significant reductions in self-reported pain levels or TMJ clicking were found for patients who initially presented with an MMO of <37 mm or >45 mm. However, most studies were at high risk of bias, follow-up varied or was not reported, and hard, soft, flat, stabilization and anterior repositioning splints were represented in the trials. In an additional 4 meta-analyses, 2 reported decreases in pain while the other 2 did not.11Zhang C, Wu J-Y, Deng D-L, He B-Y, Tao Y, Niu Y-M, Deng M-H. Efficacy of splint therapy for the management of temporomandibular disorders: a meta-analysis. Oncotarget 2016;7(51):84043-53. The use of a particular type of splint must consider efficacy, safety and their potential adverse events, e.g., occlusal changes, posterior open bite, aspiration/ingestion and tooth mobility.22Conti PCR, Corrêa AS, Lauris JRP, Stuginski-Barbosa J. Management of painful temporomandibular joint clicking with different intraoral devices and counseling: a controlled study. J Appl Oral Sci 2015;23(5):529-35. In one meta-analysis, a significant improvement in maximal mouth opening (MMO) was observed following splint therapy only in adults with an initial MMO of 37 mm to 45 mm. Anterior repositioning splints have been shown to effectively manage pain in patients with disc displacement with reduction (DDwR).5Pihut M, Gorecka M, Ceranowicz P, Wieckiewicz M. Management of pain related to temporomandibular joint disc displacement with reduction. Pain Res Management 2018;Article ID 9089286, 6 pages. doi.org/10.1155/2018/9089286. These splints are designed to promote a condyle-disc-fossa relationship that would decrease pain and TMJ noise.22Conti PCR, Corrêa AS, Lauris JRP, Stuginski-Barbosa J. Management of painful temporomandibular joint clicking with different intraoral devices and counseling: a controlled study. J Appl Oral Sci 2015;23(5):529-35. In a recent study in patients with DDwR, this design was found to significantly decrease pain after 4 and 16 weeks when worn twenty hours/day.5Pihut M, Gorecka M, Ceranowicz P, Wieckiewicz M. Management of pain related to temporomandibular joint disc displacement with reduction. Pain Res Management 2018;Article ID 9089286, 6 pages. doi.org/10.1155/2018/9089286. Decreases in TMJ clicking were also reported. Patients in another study were randomly assigned to wear an anterior repositioning splint or a nociceptive trigeminal inhibition clenching suppression system device (NTI-tss) while sleeping, and also received education on self-care and behavioral changes.22Conti PCR, Corrêa AS, Lauris JRP, Stuginski-Barbosa J. Management of painful temporomandibular joint clicking with different intraoral devices and counseling: a controlled study. J Appl Oral Sci 2015;23(5):529-35. The control group received only education. Significant reductions in self-reported intensity of pain were found at 2 weeks and 3 months for all groups. For patients wearing an anterior repositioning splint, an NTI-tss, or receiving only counseling, 83%, 75% and 56%, respectively, reported pain reduction after 3 months. (Figure 3) It was, however, noted that 27 of 60 subjects were lost during the study. No significant improvements were found for range of motion, TMJ sounds or pressure pain threshold. TMJ noise became more frequent for the NTI-tss group. Figure 3. Percentage of patients experiencing reduced pain after treatment22Conti PCR, Corrêa AS, Lauris JRP, Stuginski-Barbosa J. Management of painful temporomandibular joint clicking with different intraoral devices and counseling: a controlled study. J Appl Oral Sci 2015;23(5):529-35. Analgesics can be used for symptomatic relief, anxiolytics to relieve anxiety, and muscle relaxants when the etiology is traced to muscle spasm. In a review of 41 randomized, controlled trials in adults, NSAIDs as well as corticosteroid and hyaluronate injections were found to be effective in reducing TMJ-related pain, and a muscle relaxant (cyclobenzaprine) was effective for muscle-related pain.23Häggman-Henrikson B, Alstergren P, Davidson T, Högestätt ED, Östlund P, Tranaeus S, Vitols S, List T. Pharmacological treatment of oro-facial pain - health technology assessment including a systematic review with network meta-analysis. J Oral Rehabil 2017;44(10):800-26. Analgesics can be used for symptomatic relief, anxiolytics to relieve anxiety, and muscle relaxants when the etiology is traced to muscle spasm. There is some evidence that acupuncture can be an effective treatment for TMD, with one review finding acupuncture significantly more effective than placebo in reducing TMD myofascial pain, and with similar efficacy to occlusal splints.24Fernandes AC, Duarte Moura DM, Da Silva LGD, De Almeida EO, Barbosa GAS. Acupuncture in temporomandibular disorder myofascial pain treatment: A systematic review. J Oral Fac Pain Headache 2017;31(3):225-32. Physiotherapy has also been demonstrated to be effective in certain cases. In a study comparing the effects of occlusal splint therapy and physiotherapy, long-term success rates of 51% to 60% were reported for both methods in the treatment of myofascial TMD.25van Grootel RJ, Buchner R, Wismeijer D, van der Glas HW. Towards an optimal therapy strategy for myogenous TMD, physiotherapy compared with occlusal splint therapy in an RCT with therapy-and-patient-specific treatment durations. BMC Musculoskel Dis 2017;18:76. doi 10.1186/s12891-017-1404-9. Evidence is limited for manual manipulation and lacking/limited for pain reduction following alternative treatments including laser therapy, ultrasound, transcutaneous electrical nerve stimulation (TENS) and iontophoresis.18Butts R, Dunning J, Pavkovich R, Mettille J, Mourad F. Conservative management of temporomandibular dysfunction: A literature review with implications for clinical practice guidelines (Narrative review part 2). J Bodyw Mov Ther 2017;21(3):541-8.,26Martins WR, Blasczyk JC, Aparecida Furlan de Oliveira M, Lagôa Gonçalves KF, Bonini-Rocha AC, Dugailly PM, de Oliveira RJ. Efficacy of musculoskeletal manual approach in the treatment of temporomandibular joint disorder: A systematic review with meta-analysis. Man Ther 2016;21:10-7. More invasive approaches include injection of botulinum toxin, dry needling, joint lavage and surgery.24Fernandes AC, Duarte Moura DM, Da Silva LGD, De Almeida EO, Barbosa GAS. Acupuncture in temporomandibular disorder myofascial pain treatment: A systematic review. J Oral Fac Pain Headache 2017;31(3):225-32.,27Machado E, Machado P, Wandscher VF, Marchionatti AME, Zanatta FB, Kaizer OB. A systematic review of different substance injection and dry needling for treatment of temporomandibular myofascial pain. Int J Oral Maxillofac Surg 2018. htps://doi.org/10.1016/j.ijom.2018.05.003.,28Bouchard C, Goulet J-P, El-Ouazzani M, Turgeon AF. Temporomandibular lavage versus nonsurgical treatments for temporomandibular disorders: A systematic review and meta-analysis. Int J Oral Maxillofac Surg 2018;47(11):1420-32. Botulinum toxin type-A (BTX-A) has been found to be effective in relieving TMD pain, clicking, hyperactivity and dysfunction, and pain associated with disc displacement and TMD-related tension-type headaches.24Fernandes AC, Duarte Moura DM, Da Silva LGD, De Almeida EO, Barbosa GAS. Acupuncture in temporomandibular disorder myofascial pain treatment: A systematic review. J Oral Fac Pain Headache 2017;31(3):225-32.,29Pihut M, Ferendiuk E, Szewczyk M, Kasprzyk K, Wieckiewicz M. The efficiency of botulinum toxin type A for the treatment of masseter muscle pain in patients with temporomandibular joint dysfunction and tension-type headache. J Headache Pain 2016;17:29. doi 10.1186/s10194-016-0621-1.,30Aquilina P, Vickers R, McKellar G. Reduction of a chronic bilateral temporomandibular joint dislocation with intermaxillary fixation and botulinum toxin A. Br J Oral Maxillofac Surg 2004;42:272-3. In the United States, using botulinum toxin to treat TMD is off-label in children and adults.31Food & Drug Administration. Highlighted Prescribing Information. In a systematic review of 5 studies, joint lavage reduced pain at 3 and 6 months.28Bouchard C, Goulet J-P, El-Ouazzani M, Turgeon AF. Temporomandibular lavage versus nonsurgical treatments for temporomandibular disorders: A systematic review and meta-analysis. Int J Oral Maxillofac Surg 2018;47(11):1420-32. However, the authors noted the paucity of evidence. TMD is a debilitating condition that results in significant chronic pain and reduced QoL. In order to effectively treat TMD, the etiology and diagnosis must first be confirmed.4AAPD. Guideline on Acquired Temporomandibular Disorders in Infants, Children, and Adolescents. Reference Manual 2015;37(6):273-8. Available at: http://www.aapd.org/media/Policies_Guidelines/G_TMD.pdf.,18Butts R, Dunning J, Pavkovich R, Mettille J, Mourad F. Conservative management of temporomandibular dysfunction: A literature review with implications for clinical practice guidelines (Narrative review part 2). J Bodyw Mov Ther 2017;21(3):541-8. However, there is a need for an accepted standard definition or diagnostic criteria for TMD.3de Sena MF, de Mesquita KSF, Santos FGR, Silva FWGP, Serrano KVD. Prevalence of temporomandibular dysfunction in children and adolescents. Rev Paul Pediatr 2013;31(4):538-45.,11Zhang C, Wu J-Y, Deng D-L, He B-Y, Tao Y, Niu Y-M, Deng M-H. Efficacy of splint therapy for the management of temporomandibular disorders: a meta-analysis. Oncotarget 2016;7(51):84043-53. A lack of/limited evidence has also been identified for TMD therapies. Further, small sample sizes, high/unclear risk of bias, short-duration/unspecified follow-up and other sources of study heterogeneity were found in studies examining conservative interventions, including the use of occlusal splints. Treatment efficacy has been shown for several conservative approaches, which frequently includes the use of occlusal splints. Comprehensive treatment plans including interventions to improve physical and psychological QoL are recommended. Additional research is required to determine the most effective conservative therapies, and to further elucidate associations of TMD and other chronic pain conditions, and factors impacting QoL.4AAPD. Guideline on Acquired Temporomandibular Disorders in Infants, Children, and Adolescents. Reference Manual 2015;37(6):273-8. Available at: http://www.aapd.org/media/Policies_Guidelines/G_TMD.pdf.,8Song PC, Schwartz J, Blitzer A. The emerging role of botulinum toxin in the treatment of temporomandibular disorders. Oral Dis 2007;13:253-60.,14Gonçalves DA, Bigal ME, Jales LC, Camparis CM, Speciali JG. Headache and symptoms of temporomandibular disorder: an epidemiological study. Headache 2010;50(2):231-41.,24Fernandes AC, Duarte Moura DM, Da Silva LGD, De Almeida EO, Barbosa GAS. Acupuncture in temporomandibular disorder myofascial pain treatment: A systematic review. J Oral Fac Pain Headache 2017;31(3):225-32.,27Machado E, Machado P, Wandscher VF, Marchionatti AME, Zanatta FB, Kaizer OB. A systematic review of different substance injection and dry needling for treatment of temporomandibular myofascial pain. Int J Oral Maxillofac Surg 2018. htps://doi.org/10.1016/j.ijom.2018.05.003.,28Bouchard C, Goulet J-P, El-Ouazzani M, Turgeon AF. Temporomandibular lavage versus nonsurgical treatments for temporomandibular disorders: A systematic review and meta-analysis. Int J Oral Maxillofac Surg 2018;47(11):1420-32.,32Khawaja SN, Crow H, Holmlund T, Gonzalez Y. Botulinum toxin type a for the management of masticatory muscle pain in temporomandibular disorders: A systematic review. J Dent Health Oral Disord Ther 2017;7(6):00266. doi 10.15406/jdhodt.2017.07.00266. 1.American Academy of Orofacial Pain. Orofacial Pain: Guidelines for assessment, diagnosis, and management. deLeeuw R, Klasser GD eds. 5th edition. Chicago, IL: Quintessence Publishing; 2013:127-86. 2.Butts R, Dunning J, Perreault T, Mettille J, Escaloni J. Pathoanatomical characteristics of temporomandibular dysfunction: Where do we stand? (Narrative review part 1). J Bodywork Movement Ther 2017; http://dx.doi.org/10.1016/j.jbmt.2017.05.017. 3.de Sena MF, de Mesquita KSF, Santos FGR, Silva FWGP, Serrano KVD. Prevalence of temporomandibular dysfunction in children and adolescents. Rev Paul Pediatr 2013;31(4):538-45. 4.AAPD. Guideline on Acquired Temporomandibular Disorders in Infants, Children, and Adolescents. Reference Manual 2015;37(6):273-8. Available at: http://www.aapd.org/media/Policies_Guidelines/G_TMD.pdf. 5.Pihut M, Gorecka M, Ceranowicz P, Wieckiewicz M. Management of pain related to temporomandibular joint disc displacement with reduction. Pain Res Management 2018;Article ID 9089286, 6 pages. doi.org/10.1155/2018/9089286. 6.Schiffman E, Ohrbach R, Truelove E, Look J, Anderson G, Goulet JP, List T, et al. Diagnostic criteria for temporomandibular disorders (DC/TMD) for clinical and research applications: recommendations of the International RDC/TMD Consortium Network and Orofacial Pain Special Interest Group. J Oral Fac Pain Headache 2014;28(1):6-27. 7.Dıraçoǧlu D, Yıldırım NK, Saral I, Özkan M, Karana A, Özkan S, Aksoy C. Temporomandibular dysfunction and risk factors for anxiety and depression. J Back Musculoskel Rehabil 2015;1:1-5. 8.Song PC, Schwartz J, Blitzer A. The emerging role of botulinum toxin in the treatment of temporomandibular disorders. Oral Dis 2007;13:253-60. 9.Scrivani SJ, Khawaja SN, Bavia PF. Nonsurgical management of pediatric temporomandibular joint dysfunction. Oral Maxillofac Surg Clin North Am 2018;30(1):35-45. 10.Kim T-Y, Shin J-S, Lee J, Lee YJ, Kim M-R, Ahn Y-j, Park KB, Hwang DS, Ha IH. Gender difference in associations between chronic temporomandibular disorders and general quality of life in Koreans: A cross-sectional study. PLoS ONE 2015;10(12) e0145002. 11.Zhang C, Wu J-Y, Deng D-L, He B-Y, Tao Y, Niu Y-M, Deng M-H. Efficacy of splint therapy for the management of temporomandibular disorders: a meta-analysis. Oncotarget 2016;7(51):84043-53. 12.Häggman-Henrikson B, Rezvani M, List T. Prevalence of whiplash trauma in TMD patients: a systematic review. J Oral Rehabil 2014;41(1):59-68. 13.Gil-Martínez A, Grande-Alonso M, López-de-Uralde-Villanueva I, López-López A, Fernández-Carnero J, La Touche R. Chronic temporomandibular disorders: disability, pain intensity and fear of movement. J Headache Pain 2016;17:103. doi 10.1186/s10194-016-0690-1. 14.Gonçalves DA, Bigal ME, Jales LC, Camparis CM, Speciali JG. Headache and symptoms of temporomandibular disorder: an epidemiological study. Headache 2010;50(2):231-41. 15.Bitiniene D, Zamaliauskiene R, Kubilius R, Leketas M, Gailius T, Smirnovaite K. Quality of life in patients with temporomandibular disorders. A systematic review. Stomatologija, Baltic Dent Maxillofac J 2018;20:3-9. 16.Song H-S, Shin J-S, Lee J, Lee YJ, Kim M-R, Cho J-H, Kim KW, Park Y, Song HJ, Park SY, Kim S, Kim M, Ha IH. Association between temporomandibular disorders, chronic diseases, and ophthalmologic and otolaryngologic disorders in Korean adults: A cross-sectional study. PLoS ONE 2018;13(1): e0191336. https://doi.org/10.1371/journal.pone.0191336. 17.Han DH. The association between temporomandibular disorders and suicide ideation in a representative sample of the South Korean population. J Oral Fac Pain Headache 2014;28(4):338-45. 18.Butts R, Dunning J, Pavkovich R, Mettille J, Mourad F. Conservative management of temporomandibular dysfunction: A literature review with implications for clinical practice guidelines (Narrative review part 2). J Bodyw Mov Ther 2017;21(3):541-8. 19.Aggarwal VR, Lovell K, Peters S, Javidi H, Joughin A, Goldthorpe J. Psychosocial interventions for the management of chronic orofacial pain. Cochrane Database Syst Rev 2011;(11: ):CD008456. 20.Wieckiewicz M, Boening K, Wiland P, Shiau Y-Y, Paradowska-Stolarz A. Reported concepts for the treatment modalities and pain management of temporomandibular disorders. J Headache Pain 2015;16:106. doi 10.1186/s10194-015-0586-5. 21.Ataran R, Bahramian A, Jamali Z, Pishahang V, Barzegani HS, Sarbakhsh P, Yazdani J. The role of botulinum toxin A in treatment of temporomandibular joint disorders: A review. J Dent Shiraz Univ Med Sci 2017;18(3):157-64. 22.Conti PCR, Corrêa AS, Lauris JRP, Stuginski-Barbosa J. Management of painful temporomandibular joint clicking with different intraoral devices and counseling: a controlled study. J Appl Oral Sci 2015;23(5):529-35. 23.Häggman-Henrikson B, Alstergren P, Davidson T, Högestätt ED, Östlund P, Tranaeus S, Vitols S, List T. Pharmacological treatment of oro-facial pain - health technology assessment including a systematic review with network meta-analysis. J Oral Rehabil 2017;44(10):800-26. 24.Fernandes AC, Duarte Moura DM, Da Silva LGD, De Almeida EO, Barbosa GAS. Acupuncture in temporomandibular disorder myofascial pain treatment: A systematic review. J Oral Fac Pain Headache 2017;31(3):225-32. 25.van Grootel RJ, Buchner R, Wismeijer D, van der Glas HW. Towards an optimal therapy strategy for myogenous TMD, physiotherapy compared with occlusal splint therapy in an RCT with therapy-and-patient-specific treatment durations. BMC Musculoskel Dis 2017;18:76. doi 10.1186/s12891-017-1404-9. 26.Martins WR, Blasczyk JC, Aparecida Furlan de Oliveira M, Lagôa Gonçalves KF, Bonini-Rocha AC, Dugailly PM, de Oliveira RJ. Efficacy of musculoskeletal manual approach in the treatment of temporomandibular joint disorder: A systematic review with meta-analysis. Man Ther 2016;21:10-7. 27.Machado E, Machado P, Wandscher VF, Marchionatti AME, Zanatta FB, Kaizer OB. A systematic review of different substance injection and dry needling for treatment of temporomandibular myofascial pain. Int J Oral Maxillofac Surg 2018. htps://doi.org/10.1016/j.ijom.2018.05.003. 28.Bouchard C, Goulet J-P, El-Ouazzani M, Turgeon AF. Temporomandibular lavage versus nonsurgical treatments for temporomandibular disorders: A systematic review and meta-analysis. Int J Oral Maxillofac Surg 2018;47(11):1420-32. 29.Pihut M, Ferendiuk E, Szewczyk M, Kasprzyk K, Wieckiewicz M. The efficiency of botulinum toxin type A for the treatment of masseter muscle pain in patients with temporomandibular joint dysfunction and tension-type headache. J Headache Pain 2016;17:29. doi 10.1186/s10194-016-0621-1. 30.Aquilina P, Vickers R, McKellar G. Reduction of a chronic bilateral temporomandibular joint dislocation with intermaxillary fixation and botulinum toxin A. Br J Oral Maxillofac Surg 2004;42:272-3. 31.Food & Drug Administration. Highlighted Prescribing Information. 32.Khawaja SN, Crow H, Holmlund T, Gonzalez Y. Botulinum toxin type a for the management of masticatory muscle pain in temporomandibular disorders: A systematic review. J Dent Health Oral Disord Ther 2017;7(6):00266. doi 10.15406/jdhodt.2017.07.00266.